As found! Doesn’t look much different, but it certainly didn’t work as well! Electronics from this era tend to be very modular, and this clock was no exception. 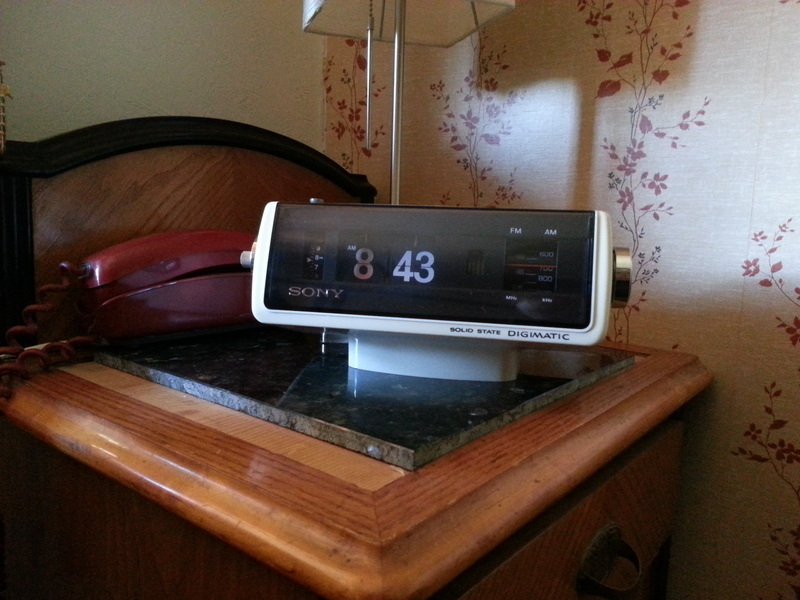 The clock itself and the radio are two completely separate units, and can operate independently of each other. The only connection between the clock and the radio is the sensor that lets the radio know when the alarm time is reached, so it can flick on the radio or start to buzz. Disassembled, and ready for repair! Electric clocks from this era kept time in an ingenious way, completely different from what we’re used to today. Instead of using electronics to count the passing of time, the heart of these clocks is a synchronous AC motor, which uses the mains frequency of 60Hz (Here in North America, anyway) as a pacemaker to maintain a very precise rotational speed. These motors are very low power, and low torque, so any resistance at all can get them to bog down and cease to spin. Old, dried up lubricant in the gearbox turned out to be the culprit in this case, and after a flush and a re-lube, everything was spinning fine. 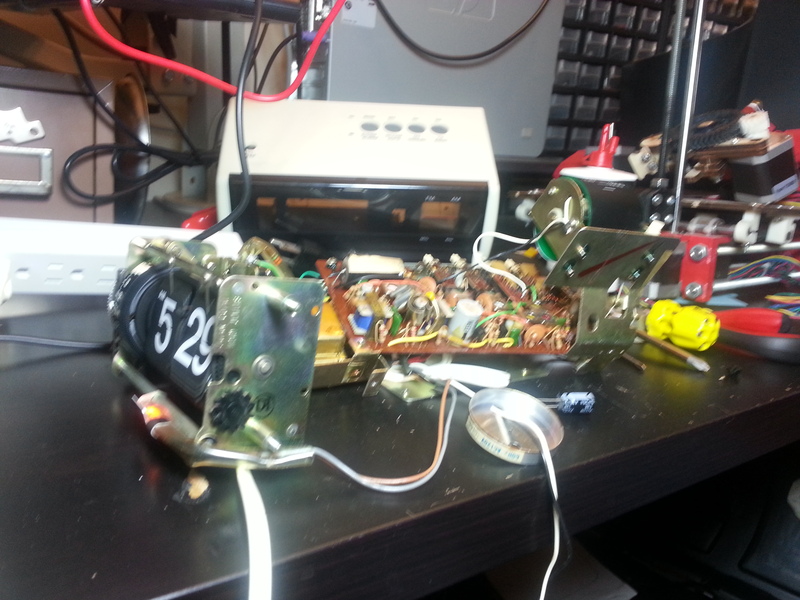 I was able to reassemble the clock, and get things working as close to new as I could manage. Once I solved that problem, I had a look at the radio board. Although everything appeared to be working properly, there was a noticeable 60Hz hum from the speaker when the radio was on, as well as some static when adjusting the volume. As old as it is, the electrolytics in it were all way past their “best before” date, so I ran through and replaced them “while I was in there.” I also flushed out the switches and pots with CRC flushing cleaner to get rid of nasty noises when pressing buttons. Pushbuttons! All needed flushing and cleaning. 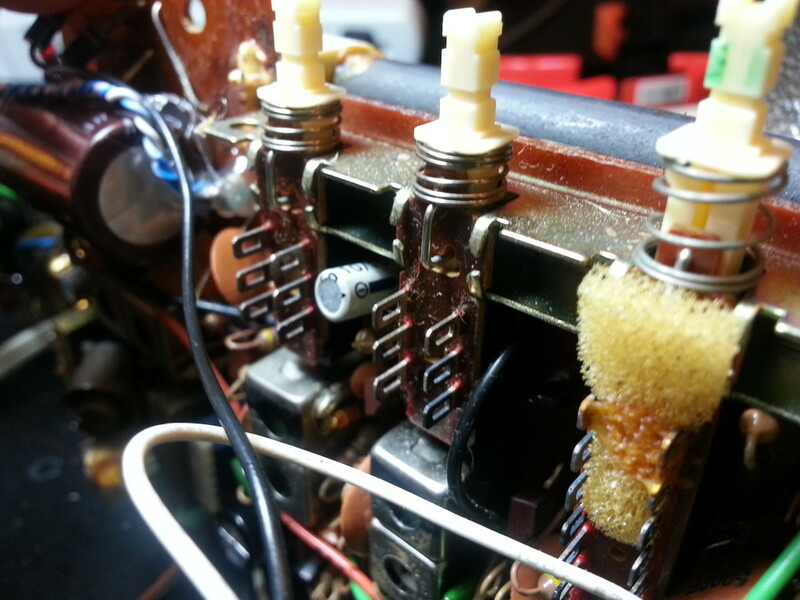 I did run into a bit of a jam with one of the electrolytics I needed to replace. The original was an axial cap, and the one I was replacing it with was radial, so I had to extend the positive lead with a bit of spare solid core wire to get it to sit where the old one was. I didn’t get any photos of the finished product, but here’s the old one — Took this photo to make sure I’d get the polarity right when I reinstalled it! Big old axial electrolytic. Needed to remember which end was which! Everything turned out very well in the end though. 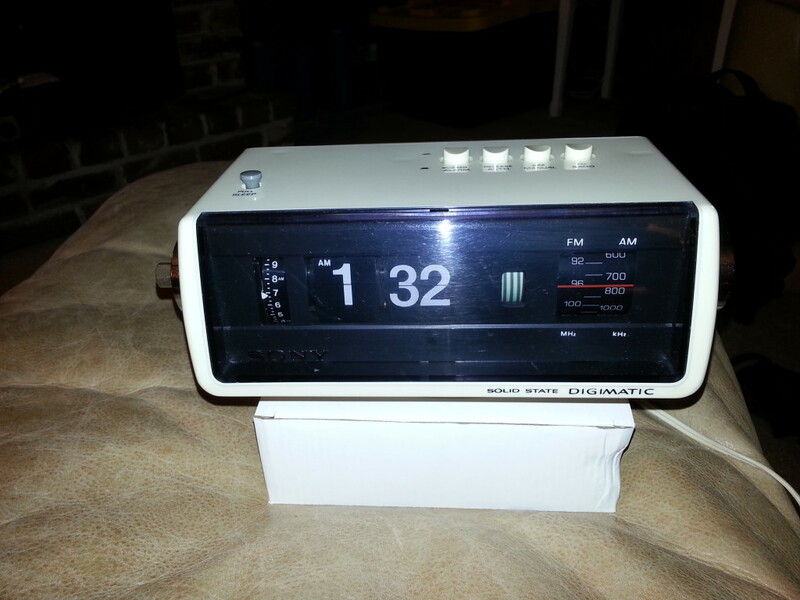 The radio no longer has any hum, and the clock has been keeping excellent time on my bedside table. 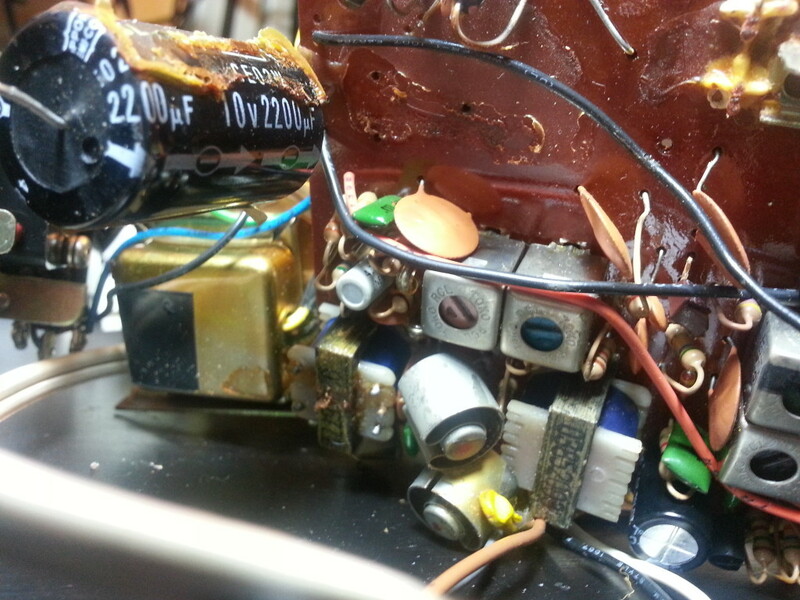 This entry was posted in Electronics, Repair, Restoration. Hey! Great work! 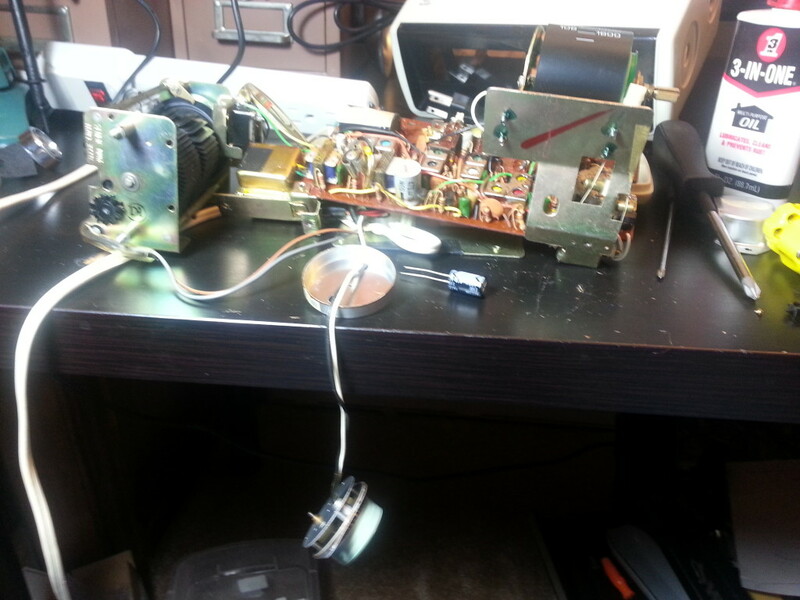 I´ve just purchased a similar clock, Sony digimatic icf-670, with the same problems. I was able to solve it lubing the motor with WD40. Now it works, but my problem is that the hours number changes at 20 minutes, not 00. Do you have any idea how i can fix this? Honestly, I’m not sure how to resolve that. I do know that on these clocks, each “hour” has two cards, and at (I believe) half past the hour, it flips down to reveal the same number. It sounds like the flip mechanism is out of sync between hour and minute, and I’m not sure that’s any sort of easy fix. I didn’t fiddle too much with the time mechanism (that’s usually a recipe for disaster) other than the motor itself, but you these types of clocks, tend to function somewhat like odometers, where they’re driven from the lowest number to the highest, and each successive number “reel” has a pawl on it to actuate the next one when the time comes. Not sure if it’s the same with one of these clocks, but it’d be worth looking to see if the mechanics are out of whack. Be very gentle, and try to not disassemble the whole thing, or you’ll likely never get it back together without the factory assembly jigs and stuff. One last tip — you’ll probably want to lube the motor with light machine oil before putting it back in. WD-40 won’t give you much long-term lubrication, and the motor will fail again before too long. This is why I love old school gear, usually an easy fix. Thanks for the tip and info. The break down photos were a help to see how in depth I may need to go for this treasure. I bought it for only $3.00, almost felt like I was stealing it at that price. Thanks again.